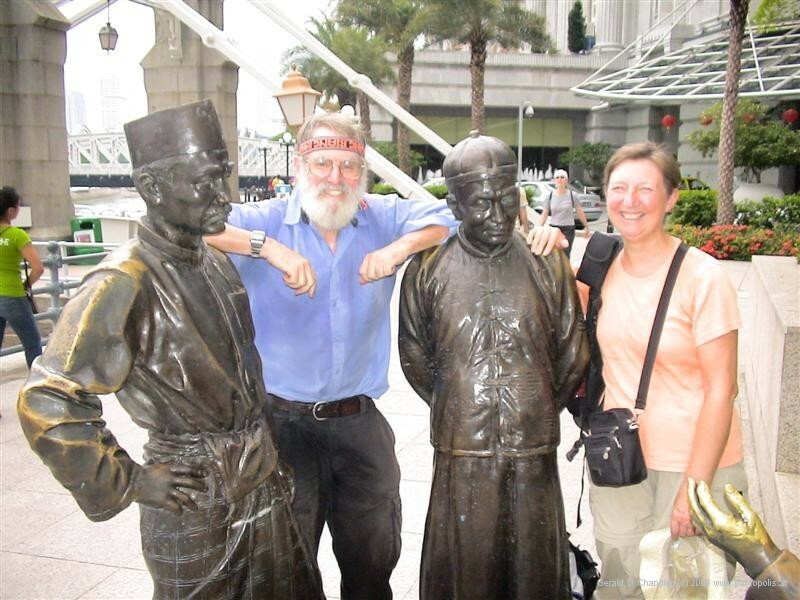 We got to Kuala Lumpur on August 31 thinking we'd just stay two or three days. Our request for a 60-day visa to Indonesia eliminated any thoughts of rushing on. It was easy anyway, since it turned out that KL is pleasant and there are plenty of things to see. We kept extending and extending until we'd passed two weeks there. We walked all over and rode their mass transit all over. We extended ourselves to see the National Museum and had a great time at the KL Bird Park. After two tries we went up to the Sky Bridge in what was once the world's tallest buildings. One afternoon was spent seeing the modern capital, Jayra Putra, built about 30 km south of KL. After nearly two weeks in KL, on September 11 we bought bus tickets to Singapore, planning to leave early Wednesday morning, Sept 12. But on Tuesday we went to one of the many Starbucks in Kuala Lampur and spent the day there using their free internet where we looked at hotels in Singapore and were shocked to learn they'd doubled their prices for the coming two weeks! Why? Because the World Bank and the associated hordes of protesters were going to be in Singapore. So Wednesday morning at the Putra Jaya bus station we changed our minds and destinations at the last minute and bought tickets to Mersing, the jumping-off point for Tioman Island, reputed to be one of the best resorts in Malaysia. We would hole up there until the World Bankers and protesters had gone home. In Mersing, a travel agent sold us 2 nights in each of two "resorts" as we couldn't make up our minds without seeing the places with our own eyes. The ride over was pleasant and gave us a chance to see Tioman in perspective: it has cragy, amazing "peaks" at the southern end. From afar (and later from up close) it really did look like a Bali Hai, which it served as in the movie version of "South Pacific". We first stayed at the Paya Resort and that was okay but we were disappointed by the postage size swimming pool. Then we moved to the Penuba Inn, about 2 kilometers farther north on the west coast. We ended up liking it a lot and stayed on an extra five days, for a total of a week. We had a detached cabin up the hill from the beach but with a nice view of the ocean (and rooftops of the buildings on the waterfront). It was fairly spartan but had air-con and with a private en-suite hot shower for about 12 pounds per night including a small breakfast. There are maybe 30 rooms altogether, a big open-air restaurant right on the beach, and best of all our very own aquarium just off the beach. We went snorkeling almost twice a day and never got bored. Several times we got to swim through schools of tiny fish (10 cm) that were so dense, you couldn't see the bottom even though it was just a few feet below them (and us). Gerry loved playing conductor: as he turned left they all moved right and vice-versa. Many people come here to go diving, which is cheap and popular and from what we've heard spectacular but we were happy with the patches of coral and sponges and fish that we have seen. We've went walking in the jungle and saw plenty of monkeys and big monitor lizards for our pains. It really is neat to hear a rustle, look up and see a monkey staring down at you! Right through the middle of our stay we had enterainment from the navies of five nations. Malaysia (the host) as well as Australia, New Zealand, Britain, and Singapore were conducting their annual exercises. We got to see them practice carrying freight from one ship to another carrying helicopters. As night many of the ships were lit up like Christmas trees. After nine day in Tioman we said that we should move on, though we were temped to extend again. The crowds from Singapore were gone and we had no more excuse. On the day of departure we took a small boat from our tiny jetty to the one nearby that went into deeper waters. There we transfered to the big boat and enjoyed a ride on the open-air deck back to Mersing. In Mersing we got a giant bucket of KFC, ate some for lunch, and then boarded the four hour bus to Singapore. That's where we are now.